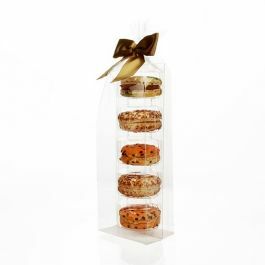 Our MBG5 Macaron Zip Handle Bag Set offers a convenient and stylish display for 10 macarons. Each set contains an 11" x 4 1/16" x 6" gusset bag with (1) resealable zipper (ZFG4) and two inserts (FPBI261) for 10 cookies (5 cookies/insert). The crystal clear zipper bag is designed with a die-cut handle for easy carrying. Clear stickers are included to secure the top and bottom trays together. 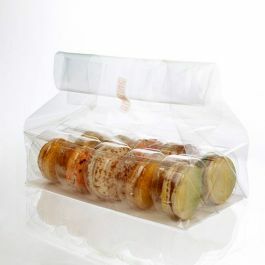 Showcase colorful cookies in this Macaron Zip Handle Bag Set. Each set contains an 11" x 4 1/16" x 6" zipper handle bag (ZFG4) and two thermoformed trays (FPBI261) that hold a total of 10 cookies (5 cookies/insert). Treats like chocolate-dipped Oreos, mini donuts, and other confections are also popular choices for this bag set. The 2 mil zipper handle bag is designed for extra strength with laminated material and a three-sided 20 mm seal. A die-cut handle provides a fun way to carry your cookies out the store, while a resealable zipper extends the freshness of your cookies. The two-piece tray (FPBI251) is perforated so you can easily form individual inserts. Apply clear round stickers on the long or short sides of the container to secure each insert. Place two inserts side-by-side in the gusset for a stunning presentation. The primary use for MBG5 is for holding ten (10) French macaron cookies.